Hollybeary Creations : Newton's Nook Feb Release Day 3! Newton's Nook Feb Release Day 3! 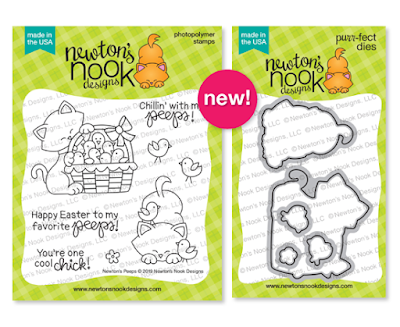 It's Day Three of the February Release from Newton's Nook Designs and today we have a Fun new Newton set called Newton's Peeps and it's Coordinating Die set. This new set is Super Cute with the Adorable Newton having Fun with his Peeps. For my card, I went clean and simple... I actually did that with most of my projects this release which is a little out of my comfort zone. I created an A2 size White card base and then I stamped one of the images onto the base with some light Grey ink. I stamped the sentiment just above in some Bold Black ink. Then I stamped the other images onto some Copic Friendly paper and colored them in and used the coordinating dies to cut them out. I adhered the images over the background image just a bit and used foam tape to pop it up. I really like the look this creates. I added a few details with a White gel pen. Adorable stamp set and card! So adorable! Love the sweet simplicity of this design! This CAS design in fab, love that you left some of it uncolored. Thanks for sharing your creativity. Darling card! Beautiful coloring of Newton and his peeps, and I love the b&w image in the background! I like the way you used color to set the main image apart from the background. what a unique card. I love how you stamped the background. Going to have to try that technique. I love the line image behind the cute coloured one...great idea. Such a cute card - I really love the shadow stamped image behind the colored image - I'm going to give that a try. Very nice! Great design with the image stamped in grey in the background. I love Newton and his peeps. Such a cute set! Love the coloring of the cute Newton on this creative card! Great job on your CAS card! These are such cute and fun images (and sentiments) in this set. Fabulous card, the spotlight coloring is so dramatic. Love this stamp set and your design. What a neat idea with the uncolored stamp on the card and then adding the colored piece on top! Wicked cool idea! 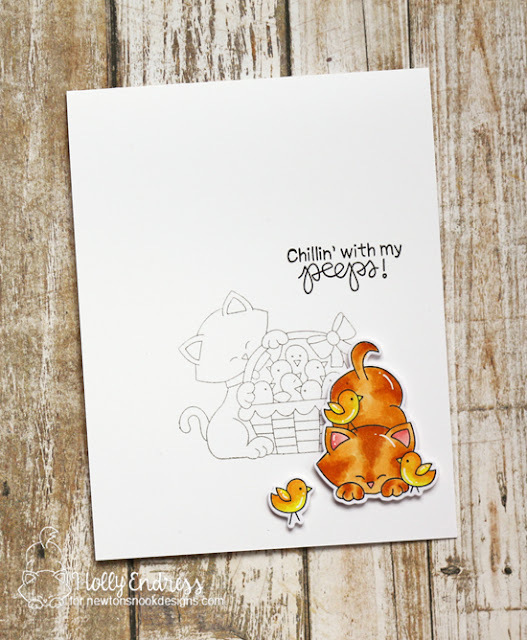 Great card, love how you used inked and colored stamp. Great idea.